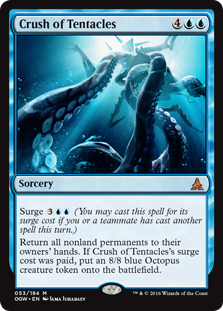 Patrick is half-referencing one of the cards in one of the two 7-1 (or better) U/G Crush of Tentacles decks from last weekend’s Star City Invitational in New Jersey… But he’s also kinda sorta playing on words. Is Standard super boring right now? Shaheen Soorani — sometimes touted as the most successful Invitational player in Star City history — might not have made Top 8, but he did go undefeated in Standard. Unsurprisingly, Shaheen’s “Esper” solution is actually two decks mashed up with two different decks (i.e. right in Mike’s wheelhouse). It’s also basically a B/W board control deck — an established quantity in Standard — splashing for Jace, Oath of Jace, and… Coax the Blind Eternities?!? 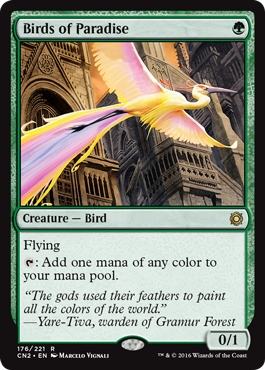 Birds of Paradise is a powerful card that has quite a bit of history to it (going back, as it does, all the way to Alpha). We all know this is one of the strongest creatures of all time, Magic’s original redundancy card, and a key contributor to countless championship decks. Instead of selling listeners on Birds [because, let’s be honest, why would they need to?] Pro Tour Champion Patrick Chapin and Resident Genius Michael J. Flores share some of their favorite Birds of Paradise stories. At first glance you might be asking yourself what the red is for. Just Fiery Impulse? What a weird splash; I mean, you can just play Dead Weight at B, right? And help your Delirium even more? … Oh yeah, Kozilek’s Return is one of the most powerful, format-bending, cards available! The one Mountain laces together the powerful Emerge strategy (with Distended Mindbender filling in for Elder Deep-Fiend) with the B/G Delirium color combination alongside the supremely powerful red sweeper. Kozilek’s Return, Languish, and Fiery Impulse work together in this deck in a way that is very hateful for Bant Company. What is a Bant Company deck supposed to do if it has Collected Company — or even both Collected Company and Spell Queller — in hand when the opponent casts Distended Mindbender (with Kozilek’s Return in the graveyard)? Do you cast Collected Company there? The Kozilek’s Return is going to sweep you. Do you cast neither? 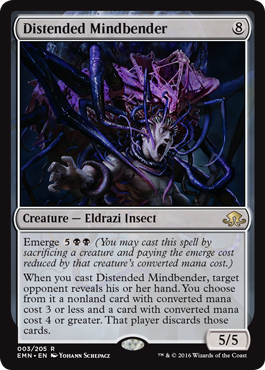 The Distended Mindbender is going to take both the good cards out of your hand. Spell Queller is little to no insurance against this deck. Spell Queller Languish; go ahead… Santana’s deck is going to get you with Fiery Impulse at just the right time to maximize the Languish, later. After a pair of weeks that saw a Spell Queller-fueled Bant Company and a retro-inspired G/W Tokens take early crowns at Star City Games Standard Opens, Pro Tour Eldritch Moon became a showcase for a number of new strategies, many of which were centered around Elder Deep-Fiend. Elder Deep-Fiend is a transitional card in Owen’s deck. It buys time and can be a powerful threat… But it’s not the end game for this deck. Owen uses Pilgrim’s Eye as his preferred Elder Deep-Fiend setup man, which is subtly important. Pilgrim’s Eye is an artifact. It’s perfect in every way, actually… A three mana creature that generates card advantage into chaining into a “four” mana “seven drop”. The basic land undoes the inherent disadvantage of the Emerge mechanic, but getting an artifact into the graveyard (and for that matter an artifact creature) makes Emrakul, the Promised End that much faster. Owen’s deck is all about Emrakul, the Promised End. If he can buy enough time with Elder Deep-Fiend, Emrakul will win it. That is the bet. 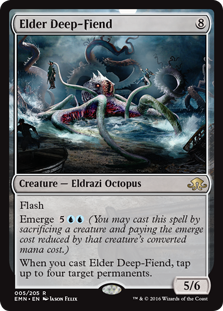 Elder Deep-Fiend has a completely different role in Andrew Brown’s deck. Rather than Emrakul being “the thing” in this deck the Deep-Fiend itself is not just a transitional card but a potential end game lock. This deck wants to chain Elder Deep-Fiend into the next (and next) copies via Sanctum of Ugin. It is quite feasible to Time Walk the opponent four or so times, attacking for 20 with massive tempo generators. Sometimes you just draw multiple copies; sometimes Grapple with the Past keeps your Eldrazi flowing. It is pretty natural for Elder Deep-Fiend-based Emerge decks to be Temur. Green is the best setup color due to cards like Grapple with the Past or mana accelerators like Primal Druid or Nissa’s Pilgrimage. Elder Deep-Fiend itself is colorless (but requires blue mana). Rounding out Temur is of course Kozilek’s Return. It is difficult to exaggerate how compelling Kozilek’s Return is in this format. It ruins all the small creature decks, and the fat casting costs on Wretched Gryff; Emrakul, the Promised End; or of course Elder Deep-Fiend buy this card back famously. We didn’t have access to all of our usual recording equipment this week. (Slight) apologies on sound quality this week. Osyp played three, Three, count em THREE copies of Tragic Arrogance in the main deck of his G/W tokens;ind out why that was awesome. Thanks Eldritch Moon! Mike is happy that that stupid G/W Tokens deck is no longer top dawg in Standard! Turns out that longtime friend, Pro Tour and Grand Prix Champion, (and notable troll storyteller) Osyp Lebedowicz cleared out last week’s Standard Open with — you guessed it — G/W Tokens. But Osyp’s version of G/W Tokens, despite playing absolutely no new Eldritch Moon cards, was innovative and ingenious. Tragic Arrogance costs five mana – I know! Weird, right? But going up to five is actually subtly advantageous in Standard if the dominant interactive card is Spell Queller. Simply, you can’t Spell Queller Tragic Arrogance. It goes over the top – We talked before about using five casting cost creatures like Archangel Avacyn or Ishkanah, the Grafwidow to the same effect [against Spell Queller]. That’s fine… Tragic Arrogance trumps other big stuff, especially in this deck. Tragic Arrogance is wildly asymmetrical in this deck – Since Osyp’s G/W list has enchantments like Evolutionary Leap, artifacts like Hangarback Walker, multiple Planeswalkers, and different kinds of creatures it can retain quite a lot of material post-Tragic Arrogance; much more, typically, than the opponent will. 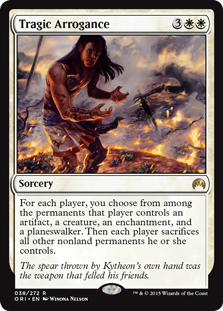 It forces the opponent to sacrifice – Unlike Planar Cleansing or Radiant Flames, Tragic Arrogance outdoes the defense of Selfless Spirit or Archangel Avacyn. Take that, interactive creature defense creatures!